247 in stock Need More ? (12) Suitable for 12 years and over. Rachel Weisz, Tom Wilkinson and Timothy Spall star in this historical drama. 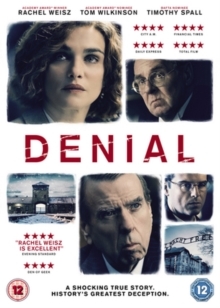 Based on her own book, the film follows American historian Deborah Lipstadt (Weisz)'s legal battle with British scholar David Irving (Spall) after he sued her and her publisher for accusing him of being a Holocaust denier in 1996. In the courtroom, Lipstadt and her British lawyers Anthony Julius (Andrew Scott) and Richard Rampton (Wilkinson) are made to prove that Irving was lying by denying the Holocaust and must therefore prove its occurrence in their defence. Desperate to take to the stand herself, Lipstadt is approached by numerous Holocaust survivors eager to testify but her legal team remain steadfast in their intention to keep the trial focused on Irving and on the validity of Lipstadt's claims.